Jordan Brand’s focus on bringing back its heralded classics in their original forms has been met with praise, but for the upcoming re-issue of the Air Jordan 5 “Grape”, the Jumpman is taking on a fresh approach by honoring a television show that has imprinted a permanent mark in cultural history. In the late 1980s, Air Jordans began to appear more and more on the feet of musicians and celebrities, and The Fresh Prince of Bel-Air, a sitcom that catapulted a young Will Smith to superstardom, was remembered for its inclusion of Jordans on several occasions. This particular release focuses on its pilot season in which the fictional Will Smith, a troubled youth from Philadelphia sent to live with his upper-class relatives in a swanky Californian suburb, disrupting the country club attire with his wildly colored couture. The Air Jordan 5 was a favorite of Will’s that season as it make appearances on several episodes and even the catchy opening credits montage. In celebration of the real Will Smith’s 50th birthday, Jordan Brand is re-issuing the popular “Grape” colorway with one key original detail – Nike Air. But as a nod to the character that campaigned for the Air Jordan 5s off-the-court popularity, the shoes won’t come attached with any shoelaces whatsoever – an obscure homage to the casual slip-on style employed by the boisterous teen. Additionally, the shoes feature the “West Philadelphia” etched below the tongue plate, while custom insoles feature boldly striped detailing with “Air Jordan” written in graffiti-like font. The question is – should Jordan Brand also please the purists with a true retro of the original? 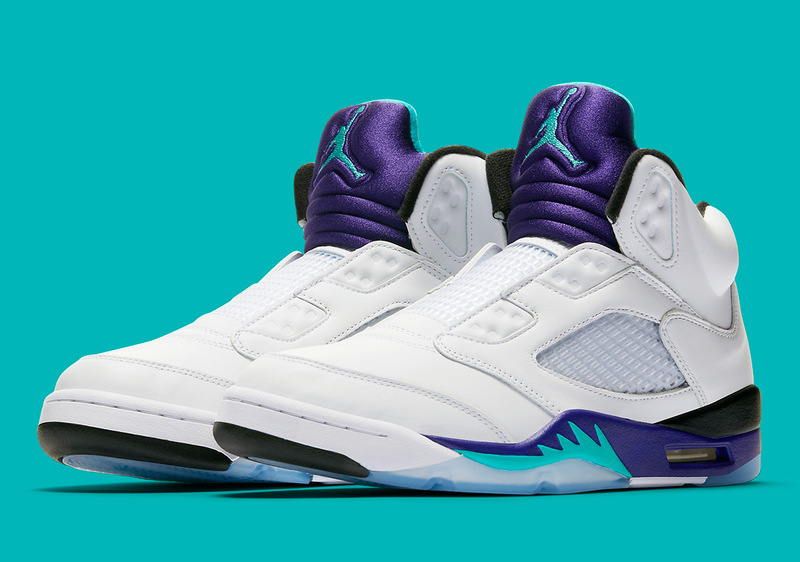 There’s no question that the Air Jordan 5 “Grape” with the teal-colored Nike Air threading on the heel will be a huge hit, so only time will tell if Jumpman will deliver. Check out a closer look at the Air Jordan 5 NRG “Fresh Prince” below and stay tuned for the official release on Will Smith’s birthday on September 25th.